For most people, muscle loss is a normal part of aging that makes daily tasks harder. Muscle loss called sarcopenia happens more quickly, leading to falls and decreased mobility. One reason for this muscle loss is that stem cells that help repair damaged muscles lose their regenerative capacity with age. 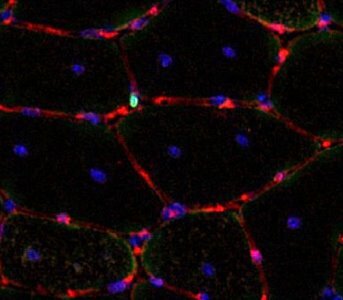 A team of researchers led by Dr. Jeffrey Dilworth received $1.5 million from Canadian Institutes of Health Research to study how the genes in muscle stem cells that control this repair ability are turned off with age. The team will first determine which stage of the muscle repair process weakens as our stem cells age. Then they will identify the epigenetic changes that prevent older stem cells from turning on genes that would normally be activated in young stem cells for repairing injured muscle. Epigenetic changes are biological mechanisms that switch genes on and off. These changes are usually reversible, so this research could lead to new therapies to rejuvenate the muscle stem cells in our aging population, improving their health and quality of life. Team Investigators include: Jeffrey Dilworth, Paul Beaulé, Guillaume Bourque, Marjorie Brand, Sasha Carsen, Peter Lapner, Allan Liew Muscle photo by Dan Robinson. Dr. Dilworth’s research is possible because of generous support for Regenerative Medicine Research at The Ottawa Hospital.